Here's a brand new slot game form the team at NetEnt with a whole bunch of cute new characters and fun features that are bound to become your new favourite. Play Wolf Cub today and immerse yourself in the colourful array of cute and cuddles characters that include; a friendly bear, owl, moose and not forgetting, the wolf. Don't be scared to explore and view these new slots online from our homepage! 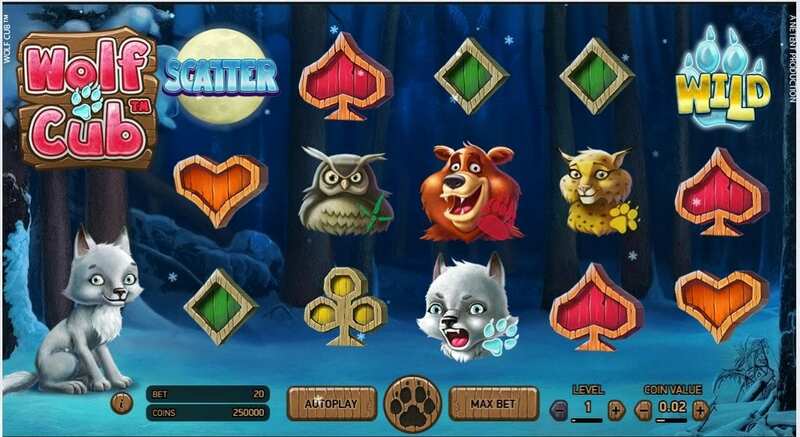 Wolf Cub is a 5 reel slot game that centres around the exploits of a wonderful group of close companions. The Wolf Cub and his friends. The Wolf Cub is a cute and cuddly wolf who will help you on your journey through the snowy reels along with his friends; the moose, the bear, and the owl. Wolf Cub is a fresh game to Wizard Slots and not one to miss out upon. NetEnt is now one of the leading developers of slots and one of our favourite developers here at Wizard Slots online casino site. All Slot gamers out there are familiar with NetEnt. For many years now NetEnt has been at the forefront of games development constantly pushing the boundaries and bringing slot games to the frontline that offer immersive experiences that transcend the ideals of slot play There range of video slots like Gonzo's quest and twin spin offer more than just 5 reels of fun and have become games that NetEnt are renowned for. Wolf Cub is a new addition to the Net Ent repertoire and certainly not a slot game to be missed. So don't wait long and try these UK slots games out now. The Scatter symbol is very obvious in this game as it’s literally branded with the word scatter. To get onto the free spins board you must match three of these symbols. Once you match 3 symbols they will change to numbers with the figure of free spins that you will be granted. This will also signal the Blizzard Feature to begin, it’s at this point when things will get a little snowy. So be ready for some deep snow and the howl of the wolf cub. The rest of the gameboard is filled with wonderfully animated wolfs, cheaters, goofy bears, and stern owls. The other lesser valued symbols are made up of beautifully crafted wooden gemstones that really add to the outdoor feel of the forest. The Wild of this game is the frozen paw print and in a similar fashion to the scatter symbol is perfectly outlined with its title. There’s not much left to do on this game other than spin. The forest is waiting for you and so is the Wolf Cub.